NATIVE EXTRACTS' innovation in CELLULAR EXTRACTION uses Biomimicry to deliver the first 'True to Nature' Blueberry extract, delivering its full plant profile of water-soluble phyto-actives, as they exist in nature – potent, active, synergistic and bio-available. Cellular Extracts are naturally multifunctional, and Aniseed Myrtle is packed with antioxidants that target a wide range of applications. Cellular Extracts are naturally multifunctional, and the Australian Blackberry offers a powerful combination of Anthocyanin, Phenolic compounds and Quercetin that have potential in a wide range of applications – anti-aging skin care, skin repair, fine lines and wrinkles, and collagen support. 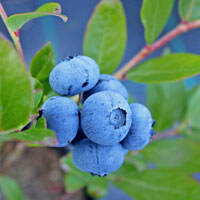 Australian Blueberry is a source of natural Anthocyanins (powerful antioxidants) found in the pigment that gives it the dark purple/black colour. Studies show Anthocyanin to have the strongest anti-inflammatory effect of any flavonoid.